Remember those locally grown avocados I received? 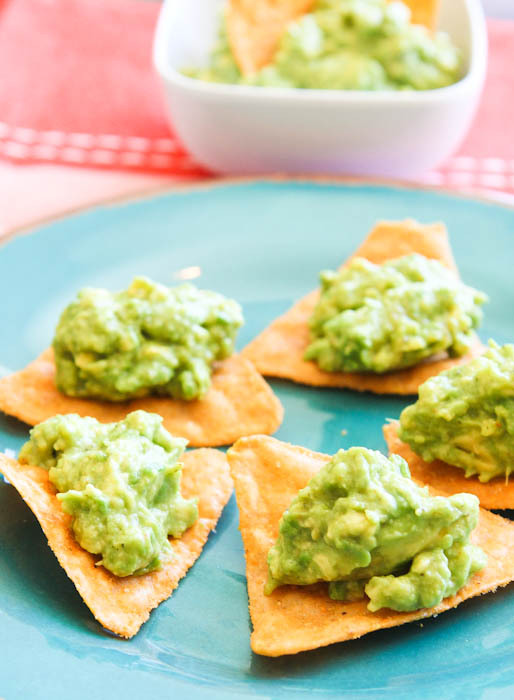 They ripened up just in time for Cinco de Mayo and I put them to use in “Cheater’s” Guacamole. It’s hard to even call this a “recipe, and no one will ever suspect you didn’t hand slice and dice all your spices. 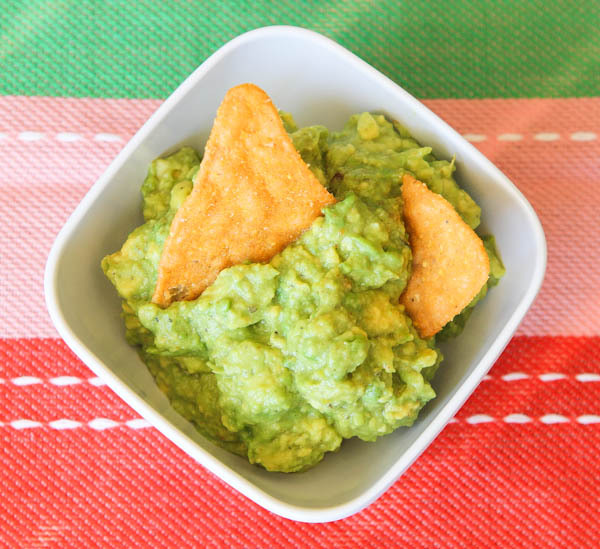 I’ve mentioned my guacamole recipe and called it “Cheater’s” Guac before, but figured the photo quality could use some sprucing up. Plus, I had avocados to use up. Peel the avocado and scoop out the flesh. Add all ingredients into a bowl, mash avocado with a fork, and stir/mash until everything is combined, while retaining some texture. Serve immediately. 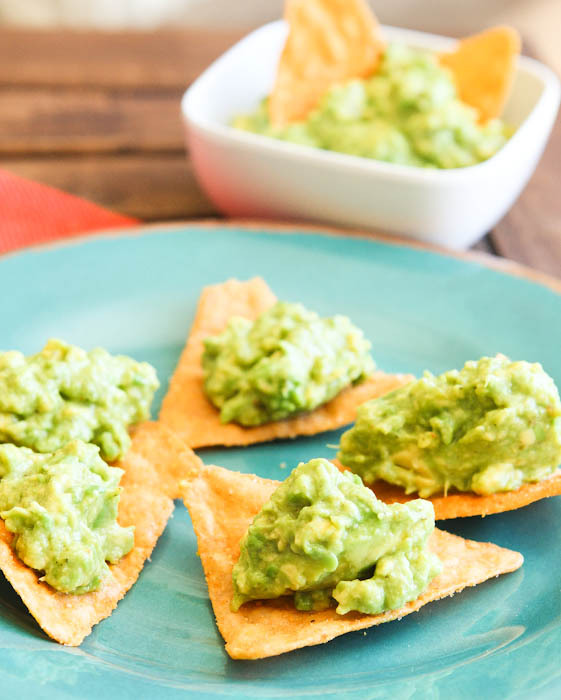 Notes & Tips: If you like chilled guacamole, take an already ripe avocado that’s been refrigerated in advance, and then make the guac. However, don’t try to ripen avocados in the fridge. They need to ripen on the countertop. Avocados oxidize (turn brown) when exposed to air. There is nothing you can do to avoid this entirely but lemon/lime juice helps. Also, covering unused guac with plastic wrap that’s placed directly on the guac helps. If you are only using half an avocado, keep the pit in the unused half to reduce oxidation. 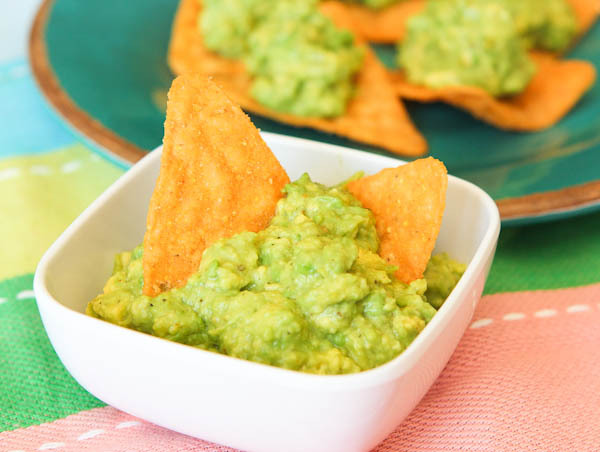 I’ve also seen people put the whole pit into a bowl of prepared guac in order to reduce oxidation. Being that this recipe takes one minute, it’s not the kind of thing you really need to “make in advance”. Lay out your very few ingredients. Lime juice is probably preferred. But if you have a cute baby Meyer lemon from the preschool teacher’s backyard tree, use that. You won’t miss chopping all that garlic and raw onions. I sure won’t. I hate garlic and onions! But in small doses like in the Mrs. 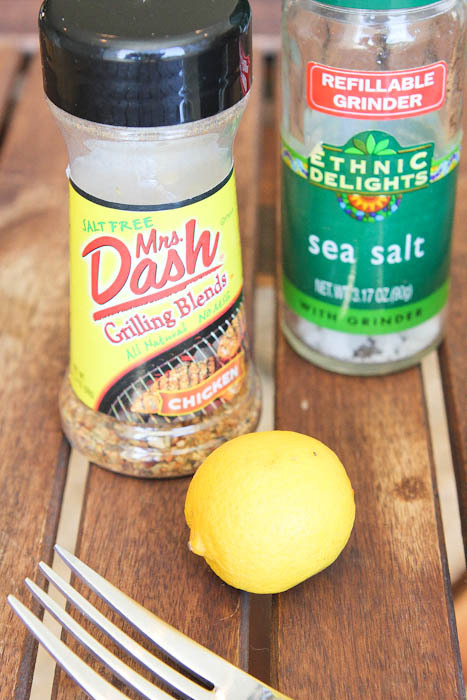 Dash and in guacamole, I can embrace stinky veggies and spices. Mash, mash. 30 seconds later your guac is ready. Scott gave me two thumbs on on this one and that’s high praise coming from the man who “doesn’t like avocados”. Really? Because he sure liked this. And Skylar loves guac, but she’s my 4 year old garbage disposal. Here she is last summer out at a Mexican restaurant. She’ll eat anything from chocolate kale chips to raw broccoli to peanut sauce baked tofu. 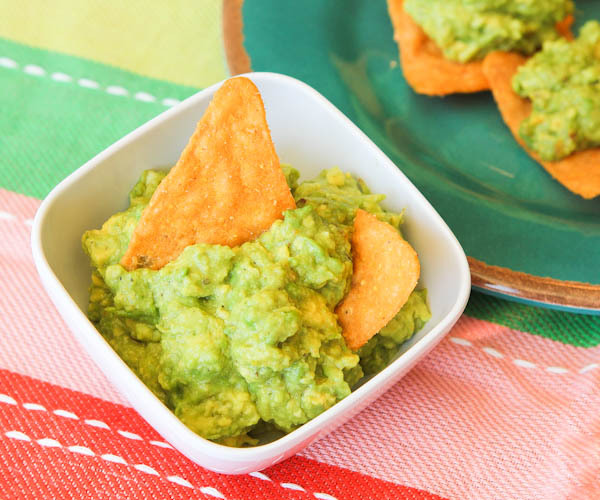 Chips + Guac = a perfect match for Cindo de Mayo or for summertime parties or just a great snack. 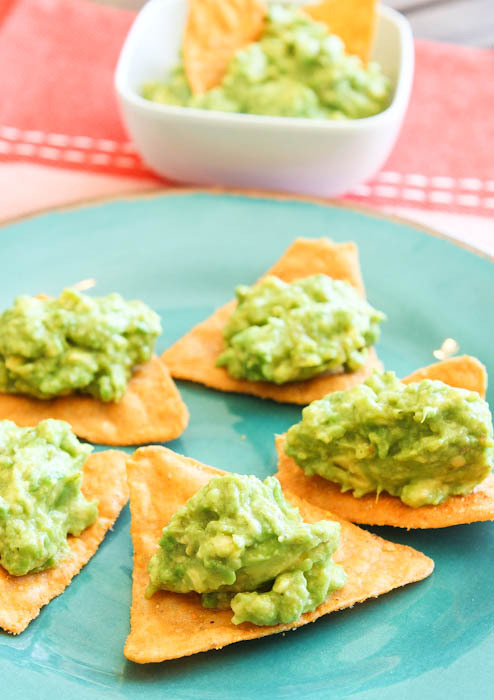 Embrace those healthy fats and get your guac on! From my previous post about the Super Natural Everyday cookbook review, I am glad the book looked good you and I always enjoy hearing everyone’s cookbook finds and go-to books you can’t live without, too. Most of all, it was great to read about who wants to write a book or cookbook. I have no idea what the future holds for me. As I said, I never say never. Fun to read about your plans, ideas, and goals, too. You cannot “taste” the avocados. Promise. It fools people, every time. And also is a 5 minute special. 1. Do you like guacamole? But I also just love plain, sliced avocados on top of salads. Creamy, rich, perfection. 2. 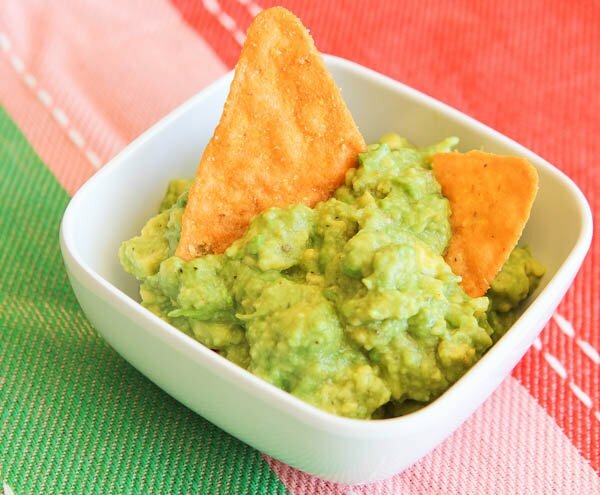 How do you like to prepare your guacamole or do you buy store bought? I never buy prepared guac in the plastic containers in the store. Knowing what I know, too, about how fast avocados can oxidize, it’s a bit scary to me how they keep the guac in those containers so green! It’s either full of green food coloring and/or tons of preservatives. I’m thinking there is just no other way. I’ll make my own, thanks. It only takes a minute after all! 3. Any plans for Cinco de Mayo? Being that I only live 10 minutes from the Mexican border and it’s 90F out right now (yes major heat wave! ), I know that there will be massive fiestas around San Diego this week. I live in the heart of a fun and hip part of town and the bars are already packed. I can smell the fajitas wafting already. The only thing left is to pour a cold drink or margarita! However, I won’t be going out because I have to work. Oh well. Here we were last summer. I’ll just enjoy these memories instead. I am fortunate the have a neighbor with a lemon tree and doesn’t mind if I use a lemon once in awhile. 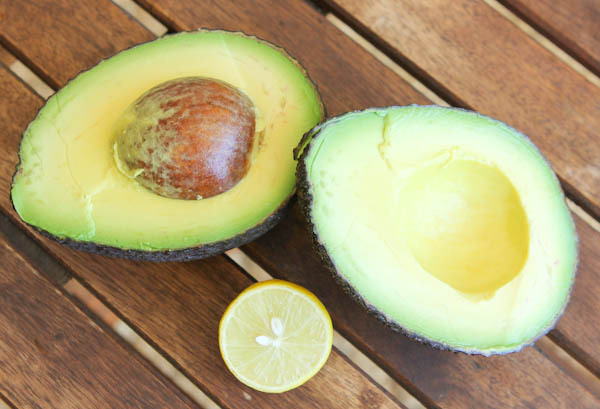 If you only use half of an avocado, you can rub lemon juice over the surface of the exposed avocado before you wrap in plastic wrap and refrigerate. Use it the next day in a sandwich for a nice treat or in a salad. While it doesn’t stay completely green, it also slows down the oxidation and it is better than not treating it at all! I am fortunate that I live on a city block where the lemons just fall off the trees certain times of the years and I collect them on my runs and that’s lucky about your neighbor’s tree! Also keeping the pit in the un-used half prevents some oxidization, too, I’ve learned. I wanted to try guacamole, since it’s a pretty tame way to taste avocado. 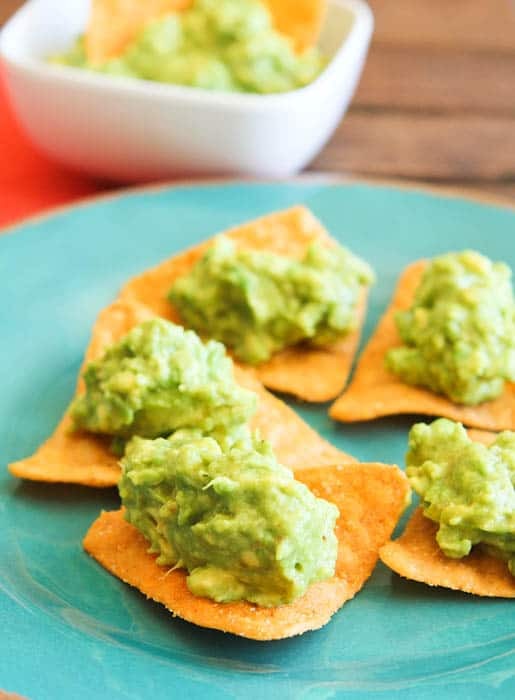 Your recipe was a great intro to avocado! Thanks! If you want it a little creamy, add a teaspoon or so of sour cream. 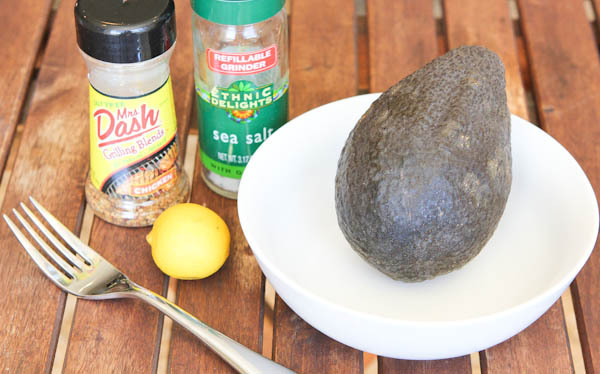 Add avocado halves, garlic salt, lemon juice & chunky salsa to a bowl. Crush avocado halves with a fork, stirring to mix ingredients as you crush. 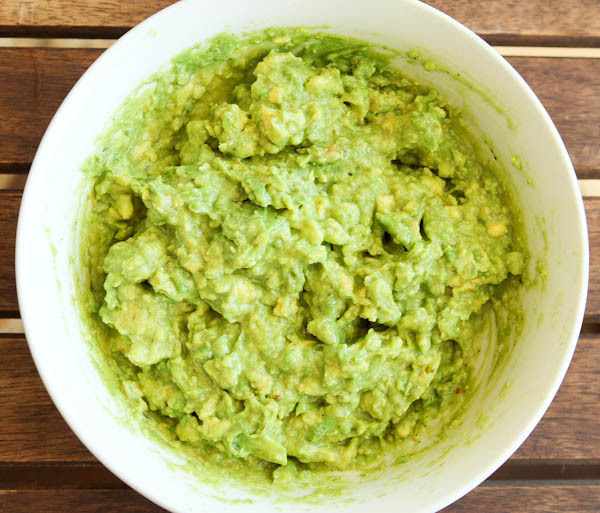 This will keep your avocado from getting too crushed, cause guacamole is ALWAYS better with chunks of avocado. Here’s the best part – taste it! Add more of any of the above ingredients, as needed, taste testing as you go, to get the perfect blend.